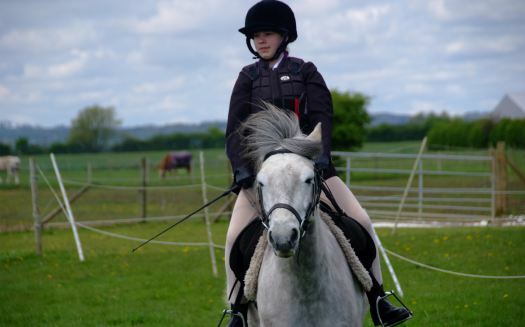 Willow farm is a caring family-run school, approved and inspected by ELDC and the Association of British Riding Schools to teach children and adults. In the Riding School we take children from 3 years old and have good facilities for teaching – 15 acres of grassland riding, an all weather floodlit rubber surfaced school, gymkhana lanes and showjumps. Pupils are prepared for the ABRS Progressive Riding and Stable Management Tests and we organise lectures, course days, fun days, and competitions in school holidays. We aim to teach in groups NOT EXCEEDING 4 riders. We teach to the highest standard for both enjoyment and safety, and any of our staff will be pleased to show visitors around and make you a coffee anytime. Each year our pupils go Carol singing at Christmas for the local Chapel, and we have an ongoing collection of used Postage stamps for Bransby Home of Rest for Horses at Lincoln. School holiday activities are busy and varied – do ask for a free newsletter. Ring 01754 830316 or contact us on Facebook.